Gangyō (元慶) was a 年号, (nengō,, lit. "year name") after Jōgan and before Ninna. This period spanned the years from April 877 through February 885. The reigning emperor was Yōzei-tennō (陽成天皇). 20 January 877 (Gangyō 1, 3rd day of the 1st month): Yōzei was formally enthroned at age 8. 877 (Gangyō 1, 2nd month): Ambassadors from Korea arrived in the Izumo province; but they were turned back. 877 (Gangyō 1, 6th month): There was a great drought; and sacrifices were made at the temples of Hachiman, Kamo and other temples in Ise province. Eventually, it rained. 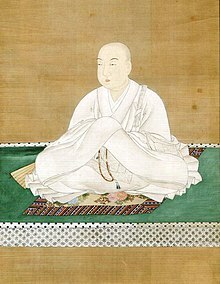 32 December 878 (Gangyō 2, 4th day of the 12th month): Former-Emperor Seiwa died at age 31. 4 March 884 (Gangyō 8, 4th day of the 2nd month): In the 8th year of Yōzei's reign, the emperor was deposed; and the succession (senso) was received by the third son of former Emperor Ninmyō. 23 March, 884 (Gangyō 8, 23rd day of the 2nd month): Kōkō accepted the monarch's role and duties and powers (sokui). This was confirmed in ceremonies. ↑ Nussbaum, Louis-Frédéric. (2005). "Gangyō" in Japan Encyclopedia, p. 231. ↑ Titsingh, Isaac. (1834). Annales des empereurs du Japon, pp. 121-124; Brown, Delmer et al. (1979). Gukanshō, p. 289; Varley, H. Paul, ed. (1980). Jinō Shōtōki, pp. 170-171. ↑ 4.0 4.1 4.2 Titsingh, p. 122. ↑ Brown, p. 289; Varley, p. 170; Imperial Household Agency (Kunaichō), 清和天皇 (56); retrieved 2012-5-22. ↑ Varley, p. 44; a distinct act of senso is unrecognized prior to Emperor Tenji; and all sovereigns except Jitō, Yōzei, Go-Toba, and Fushimi have senso and sokui in the same year until the reign of Emperor Go-Murakami. Compare Imperial Household Agency (Kunaichō), Ceremony of Accession (Sokui-no-Rei); retrieved 2012-2-16.